Having answered a couple of questions here and there, I decided to put what I know in writing. I hope it will help! What types of “schemas” currently populate Rich Snippets? 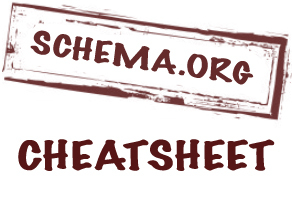 Schema.org is NOT a markup language or a protocol; it’s the collection of Microdata markup vocabulary explained and organized on the official site. Put simply, Schema.org is the attempt of search engines to make structured markup easier to understand for website owners and search crawlers. Schema.org is officially supported by Google, Bing, Yahoo! and Yandex. Google now names it the “preferred” method to structure your content if you want to have a rich snippet in search. How do I use Schema.org? 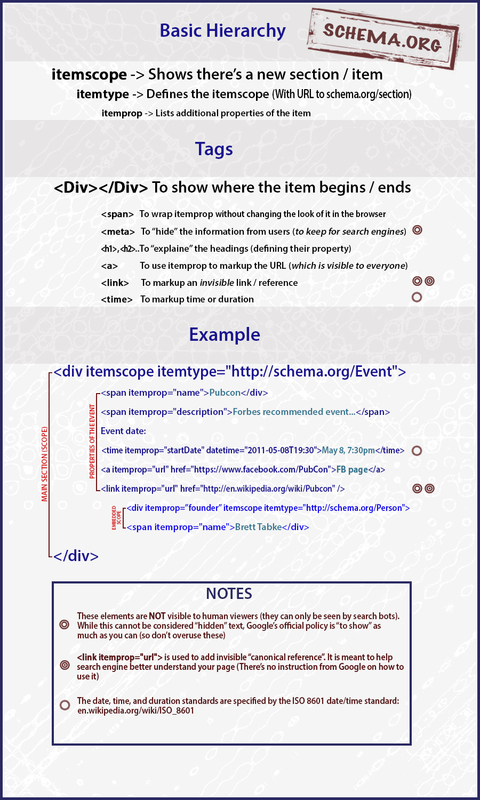 Now, let’s take a look at this very basic, yet (hopefully) easy to understand document that explains how to use the structured markup. >>>Each Itemscope has a “type” (itemtype) that actually defines the section we are starting here. >>>Itemprop actually describes each element of the itemtype (In other words, it is a property or one of the properties of a parent type. For example, itemtype = person and itemprop = author and / or spouse and /or male, etc…). As shown in the cheatsheet, Itemscope is usually put within <div></div> – because <div> is used to define the beginning and the end of the entity (thus its scope). You can have a parent itemscope and a “child” itemscope embedded in it (for example, you describe a book and want to make sure “author” entity is placed within your “book” entity). This is what is controlled by <div>. What types of schema.org markups currently populate Rich Snippets? (Related to the above) The contents of the page should reflect the schema.org markup (for example, if you show average rating in the markup, there should be actual rating ability on-page). You can use microformats, microdata, or RDFa to mark up your content. However, you should pick one markup standard and use it consistently across the page. This makes sense (the cleaner and more consistent the code is, the better); I haven’t seen Google being confused by protocol mix-up yet (I often use RDFa as that’s a default of many WordPress themes and Schema in the mix and Google seems to pick Rich data up quite fine). Probably they will get smarter and stricter in the future though. There’s no official statement from Facebook or Twitter about their support of Schema.org, so if you want to please Facebook and Twitter, you have no other choice but use their own social graph protocols (which means you’ll have to kind of break Google’s recommendation). So far people successfully use Schema.org and social graph protocols together on one page. [Sean Murray shared an example where Video rich data overtook Google Authorship while still preserving “By” and the circle numbers. Finally, if you are planning to implement Schema.org on your site, make sure to read through examples in the official tutorial. After upgrading to Genesis v.2 schema.org markup should be easier to test and track how well its working? Would be nice to have a java script site to run a scan to get a score on how well my schema is implemented? Very helpful. I hope schema develops a more user friendly way to integrate their markup. Ultimate cheat sheet for someone who is fairly new on using structured markups. Although I would like to add that Google’s structured data tester shows how well its parsers recognize its presence. 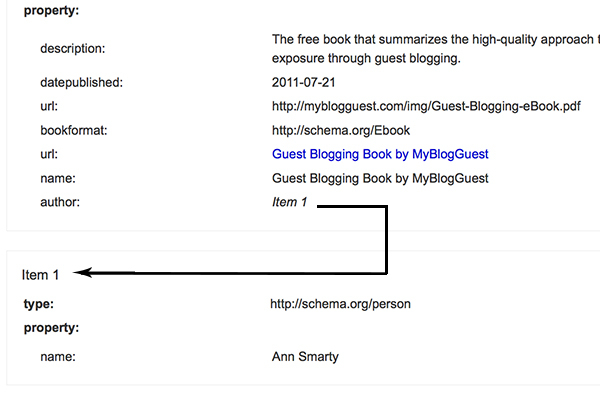 Schema.org documentation is biased to microdata- invented within Google by WHATWG HTML5 editor. Neat job! Great article here. Definitely good to know the basics of Schema.org, before applying any sort of semantic markup to your Website. Very useful information about schema.org. But I can’t change the date on it.